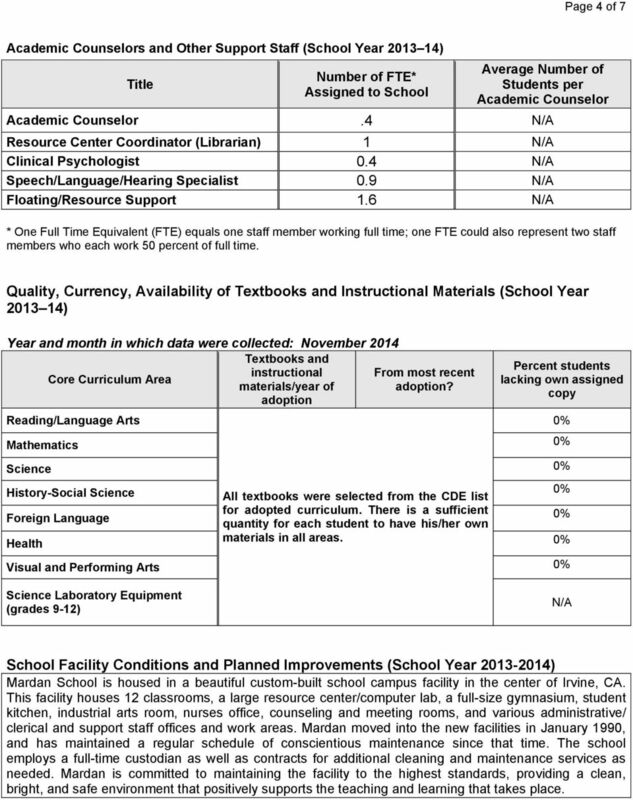 Download "California Department of Education School Accountability Report Card Reported Using Data from the 2013 14 School Year Published During 2014 15"
4 Page 4 of 7 Academic Counselors and Other Support Staff (School Year ) Title Number of FTE* Assigned to School Average Number of Students per Academic Counselor Academic Counselor.4 N/A Resource Center Coordinator (Librarian) 1 N/A Clinical Psychologist 0.4 N/A Speech/Language/Hearing Specialist 0.9 N/A Floating/Resource Support 1.6 N/A * One Full Time Equivalent (FTE) equals one staff member working full time; one FTE could also represent two staff members who each work 50 percent of full time. Quality, Currency, Availability of Textbooks and Instructional Materials (School Year ) Year and month in which data were collected: November 2014 Textbooks and instructional From most recent Core Curriculum Area materials/year of adoption? adoption Reading/Language Arts Percent students lacking own assigned copy Mathematics Science History-Social Science All textbooks were selected from the CDE list Foreign Language for adopted curriculum. There is a sufficient quantity for each student to have his/her own Health materials in all areas. Visual and Performing Arts Science Laboratory Equipment (grades 9-12) N/A School Facility Conditions and Planned Improvements (School Year ) Mardan School is housed in a beautiful custom-built school campus facility in the center of Irvine, CA. This facility houses 12 classrooms, a large resource center/computer lab, a full-size gymnasium, student kitchen, industrial arts room, nurses office, counseling and meeting rooms, and various administrative/ clerical and support staff offices and work areas. Mardan moved into the new facilities in January 1990, and has maintained a regular schedule of conscientious maintenance since that time. The school employs a full-time custodian as well as contracts for additional cleaning and maintenance services as needed. Mardan is committed to maintaining the facility to the highest standards, providing a clean, bright, and safe environment that positively supports the teaching and learning that takes place. 5 Page 5 of 7 School Facility Good Repair Status (School Year ) System Inspected Systems: Gas Leaks, Mechanical/HVAC, Sewer Interior: Interior Surfaces Cleanliness: Overall Cleanliness, Pest/ Vermin Infestation Electrical: Electrical Restrooms/Fountains: Restrooms, Sinks/ Fountains Safety: Fire Safety, Hazardous Materials Structural: Structural Damage, Roofs External: Playground/School Grounds, Windows/ Doors/Gates/Fences Overall Rating Repair Status Exemplary Good Fair Poor Repair Needed and Action Taken or Planned B. Pupil Outcomes The SARC provides the following information relevant to the Pupil Achievement State Priority (Priority 4): Statewide assessments (i.e., California Assessment of Student Performance and Progress and its successor the Standardized Testing and Reporting Program); The Academic Performance Index; and The percentage of pupils who have successfully completed courses that satisfy the requirements for entrance to the University of California and the California State University, or career technical education sequences or programs of study. State testing results are not currently reported at the non-public school level, only at the students districts. 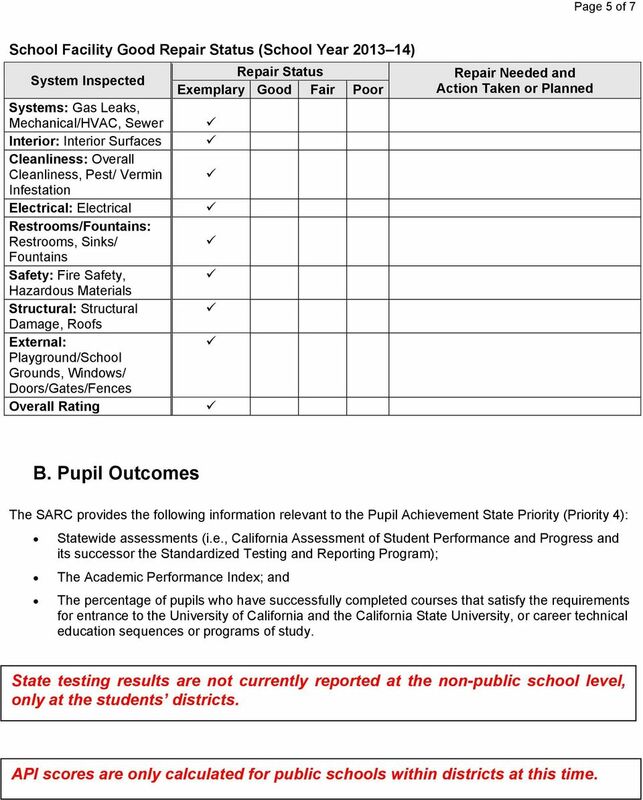 API scores are only calculated for public schools within districts at this time. 6 Page 6 of 7 Completion of High School Graduation Requirements This table displays the percent of students who began the school year in grade twelve and were a part of the school s most recent graduating class, meeting all state and local graduation requirements for grade twelve completion, including having passed both the ELA and mathematics portions of the CAHSEE or received a local waiver or state exemption. Graduating Class of 2014 Group School District State All Students 10 N/A N/A Students with Disabilities 10 N/A N/A Note: Cells shaded in black do not require data. Career Technical Education Programs (School Year ) Mardan students in secondary grades, who are or are about to turn 16, work with their teachers and counseling staff to develop Individual Transition Plans (ITPs). Upper secondary classes incorporate units that address helping students identify interests, explore career options, and practice skills such as filling out applications, writing resumes, and interviewing. Post-secondary education options are also explored, and students participate in field trips to community college campuses to meet with admissions and support counselors. 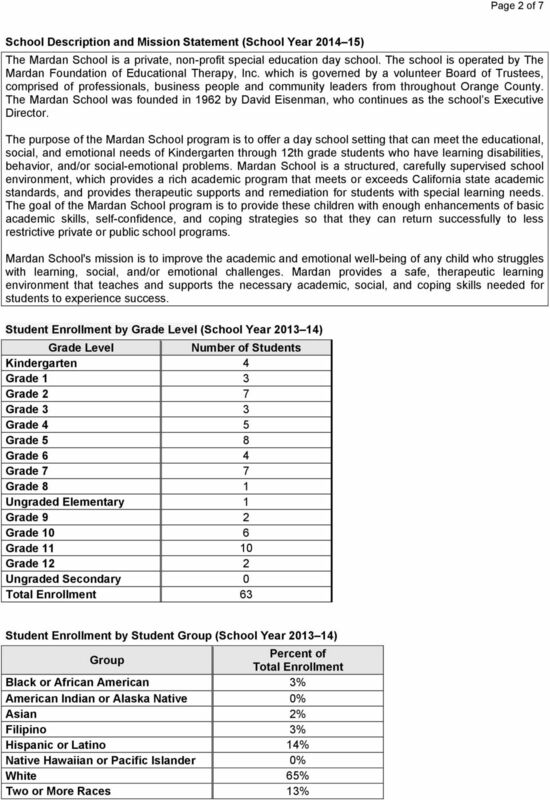 Mardan also works closely with district personnel to explore a wider variety of options that district-placed students may access for additional career counseling, ROP classes, or Workability programs offered within the district. C. Engagement Opportunities for Parental Involvement (School Year ) Parents are invited to participate in Back-to-School Night held at the beginning of the school year to meet with teaching staff and learn about the classroom program presented by their child s teacher. Parents are also invited to the Talent Show and Awards Night at the end of the year. Individual classrooms may invite their parents to come see a special presentation or project, such as a science fair. The Mardan Parent Network was formed by a group of parents in 2011 and continues today. The purpose of this group is twofold. Parents meet on a regular basis for opportunities to network and provide one another with support in the experience of raising children with special needs, and share resources. The group also works closely with Mardan administration to develop fundraising projects and schoolwide activities to further the sense of community within the school and to inform outside stakeholders of the school s mission. Throughout the year, there may be additional opportunities to support field trips and participate in fundraising activities. 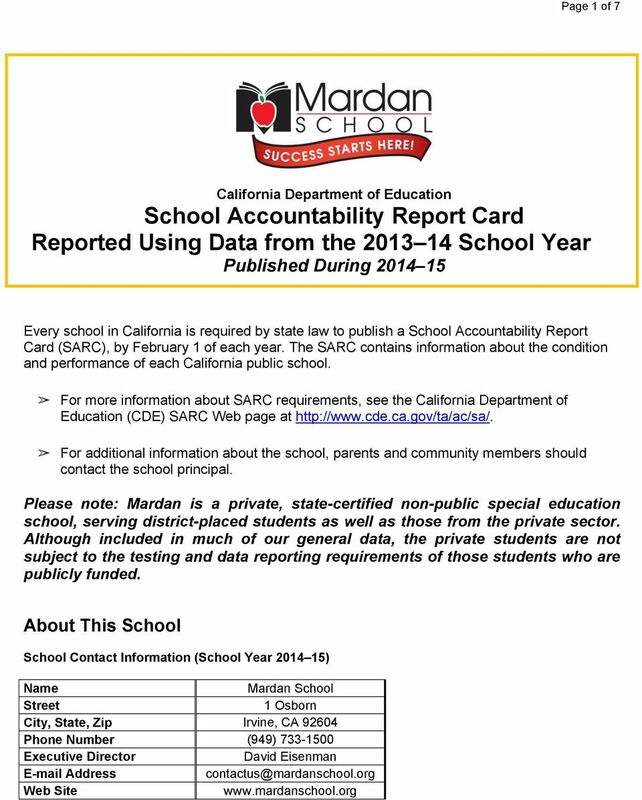 Potential volunteer opportunities are communicated via our website and s.
7 Page 7 of 7 School Climate Suspensions and Expulsions Number School School School Suspensions Expulsions District District N/A District School Safety Plan (School Year ) Mardan School has comprehensive Safety and Emergency Response Plans. The plans are evaluated yearly and amended, as needed, by the school safety committee. 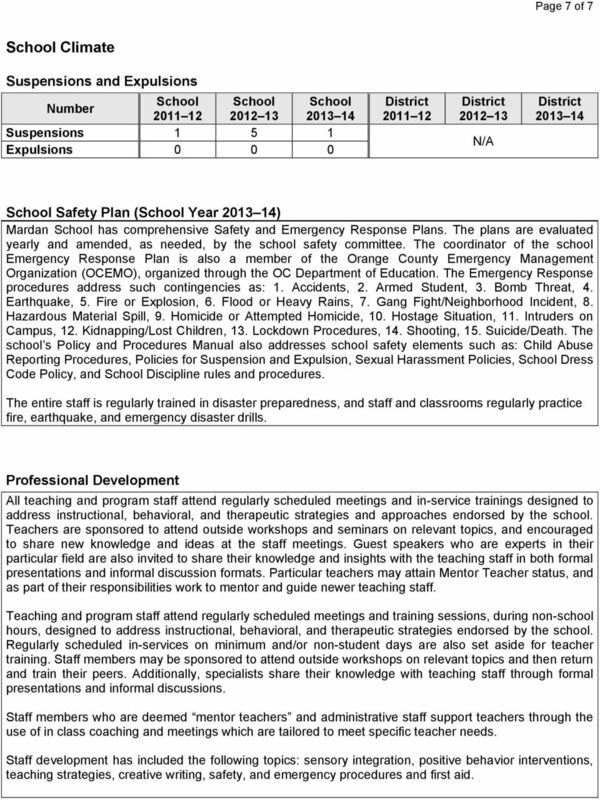 The coordinator of the school Emergency Response Plan is also a member of the Orange County Emergency Management Organization (OCEMO), organized through the OC Department of Education. The Emergency Response procedures address such contingencies as: 1. Accidents, 2. Armed Student, 3. Bomb Threat, 4. Earthquake, 5. Fire or Explosion, 6. Flood or Heavy Rains, 7. Gang Fight/Neighborhood Incident, 8. Hazardous Material Spill, 9. Homicide or Attempted Homicide, 10. Hostage Situation, 11. Intruders on Campus, 12. Kidnapping/Lost Children, 13. Lockdown Procedures, 14. Shooting, 15. Suicide/Death. The school s Policy and Procedures Manual also addresses school safety elements such as: Child Abuse Reporting Procedures, Policies for Suspension and Expulsion, Sexual Harassment Policies, School Dress Code Policy, and School Discipline rules and procedures. The entire staff is regularly trained in disaster preparedness, and staff and classrooms regularly practice fire, earthquake, and emergency disaster drills. Professional Development All teaching and program staff attend regularly scheduled meetings and in-service trainings designed to address instructional, behavioral, and therapeutic strategies and approaches endorsed by the school. Teachers are sponsored to attend outside workshops and seminars on relevant topics, and encouraged to share new knowledge and ideas at the staff meetings. Guest speakers who are experts in their particular field are also invited to share their knowledge and insights with the teaching staff in both formal presentations and informal discussion formats. Particular teachers may attain Mentor Teacher status, and as part of their responsibilities work to mentor and guide newer teaching staff. Teaching and program staff attend regularly scheduled meetings and training sessions, during non-school hours, designed to address instructional, behavioral, and therapeutic strategies endorsed by the school. 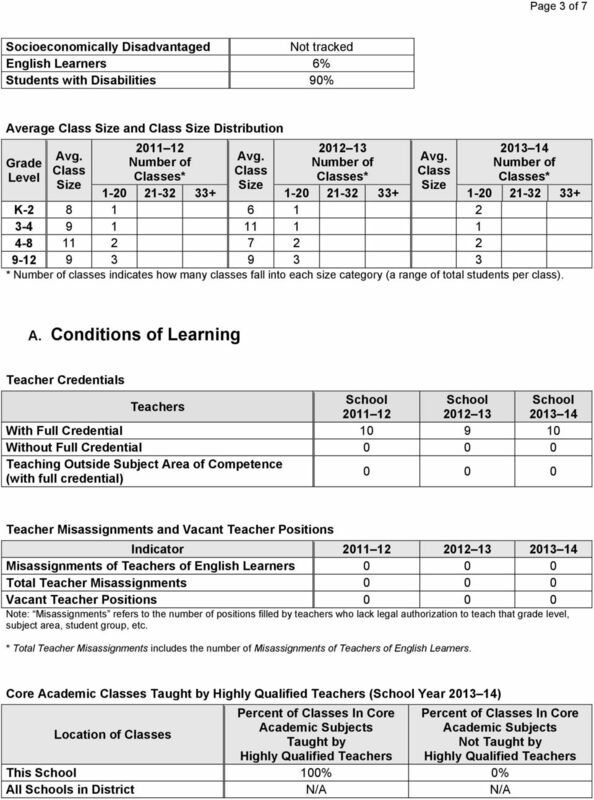 Regularly scheduled in-services on minimum and/or non-student days are also set aside for teacher training. Staff members may be sponsored to attend outside workshops on relevant topics and then return and train their peers. Additionally, specialists share their knowledge with teaching staff through formal presentations and informal discussions. Staff members who are deemed mentor teachers and administrative staff support teachers through the use of in class coaching and meetings which are tailored to meet specific teacher needs. Staff development has included the following topics: sensory integration, positive behavior interventions, teaching strategies, creative writing, safety, and emergency procedures and first aid.